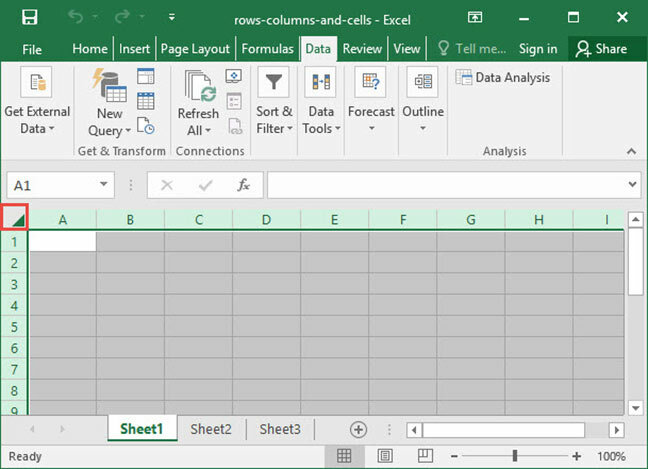 In Excel, each worksheet is organized into a grid of rows, columns, and cells. Individual cells can also be grouped into ranges, which are just series of cells strung together. These items interact with each other to form the basic layout of an Excel document. As you can see, Excel labels columns by letter. You can see column labels highlighted along the top of the screen: A, B, C, etc. Rows are highlighted along the side of the screen, and are organized by number: 1, 2, 3, etc. At the intersection of each row and column is a cell, which is just one of the boxes on the grid of a worksheet. 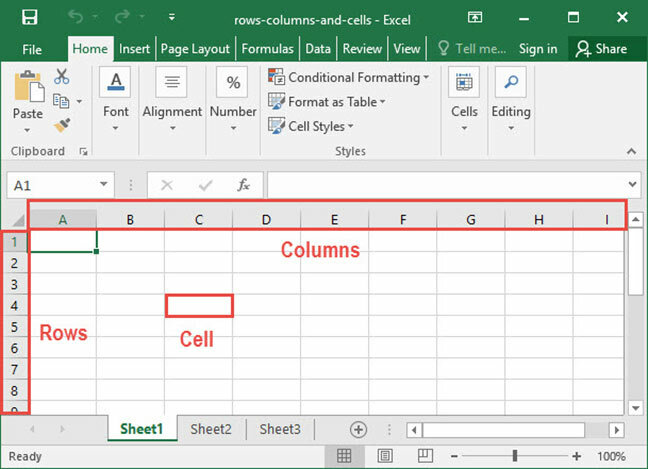 Each cell has a unique address, obtained by comining the column letter and the row number of the given cell. For example, cell B4 lies at the intersection of column B and row 4. Whenever you select a cell, you'll see its address appear in the cell address box directly above the labels columns A and B. You can also type a cell name into this box and press Enter to automatically zoom to a given cell. In this worksheet, we've highlighted the range of all cells between C3 and C6. When we want to talk about a range like this, we do so by using the colon (:) character between the first and last cells in the range, like so: C3:C6. This notation means "the range of all cells between C3 and C6". There are many things you can do to manipulate a row or column; but before you can do to, you must select it. Once you have rows or columns selected, right click their labels to bring up the row / column manipulation menu, which appears in the screenshot below. Cut / copy / paste rows or columns. Use this if you would like to duplicate rows or columns, or if you would like to rearrange their order. Insert new rows or columns. This will insert new rows above — or new columns to the left of — the row or column you have selected. Delete rows or columns. This will delete the rows or columns in question entirely and collapse the remainder of the sheet in to take the place of the removed row or column. Format rows or columns. 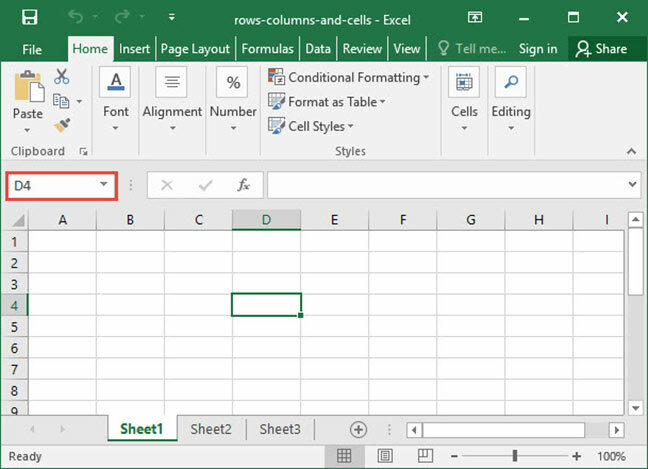 Use this option to apply formatting to each cell within a row or column. Potential formatting options include text colors, background colors, and borders. 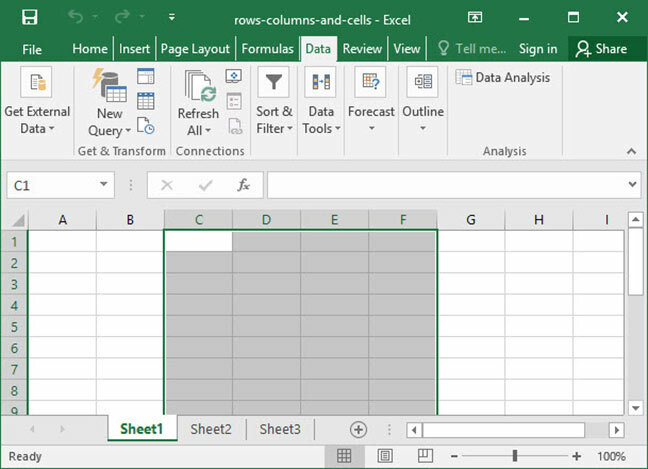 Hide and unhide rows or columns. 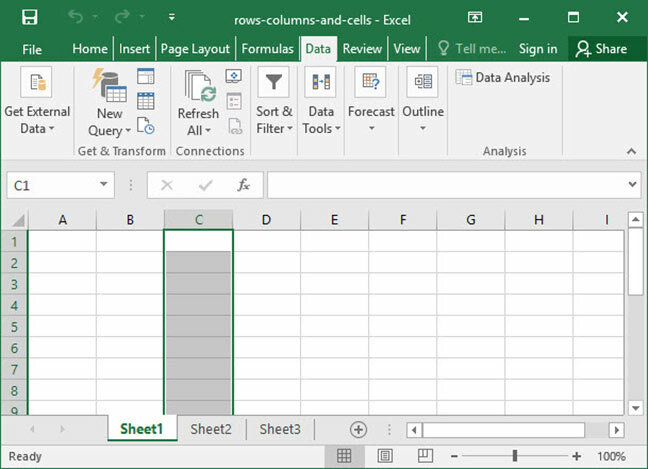 Use this option to temporarily hide or unhide rows or columns. This makes it easier to manage large spreadsheets by hiding non-critical data. You can also resize a row or column by hovering your mouse over the divider between two rows or two columns, then clicking and dragging to expand or contract it. Cells can be manipulated just like rows and columns. To do so, select a cell or range, then right click. The cell manipulation menu will appear. Cut / copy / paste cells. Use this to duplicate cells from one place in your worksheet to another. Insert new cells. 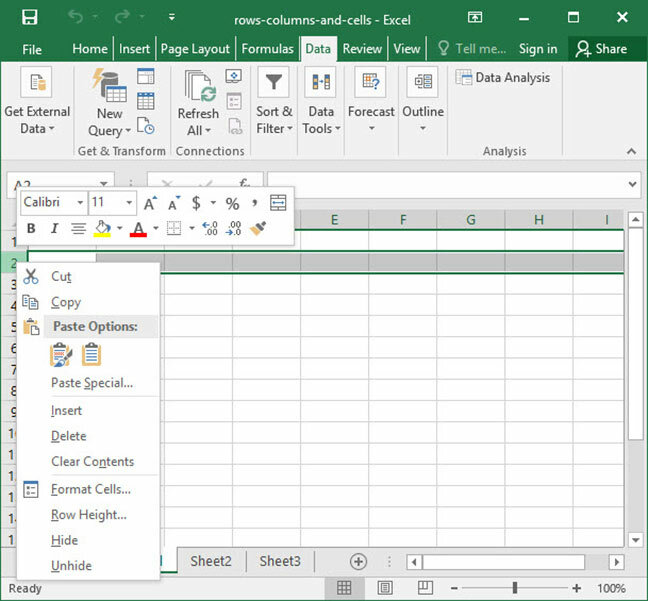 Note that when you insert a cell, you'll have to tell Excel how to do it (you must either shift rows or columns in the existing sheet to accomodate the new cell). Delete cells. Like insertion, deletion also causes a shift in your sheet. 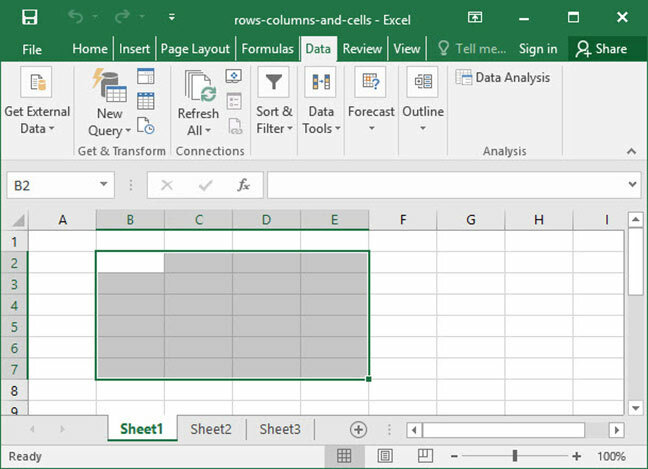 Excel will ask you where you want cells to shift when you delete a cell. Format cells. 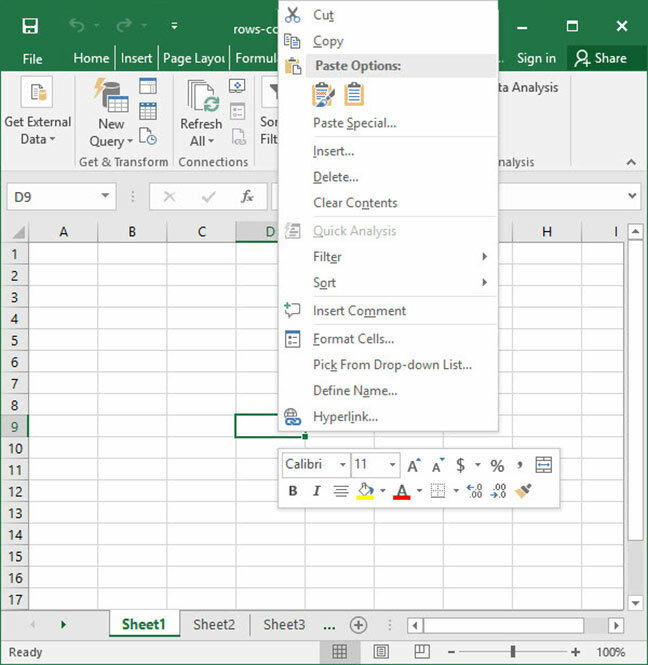 Use this option to apply formatting to each cell. Potential formatting options include text colors, background colors, and borders. 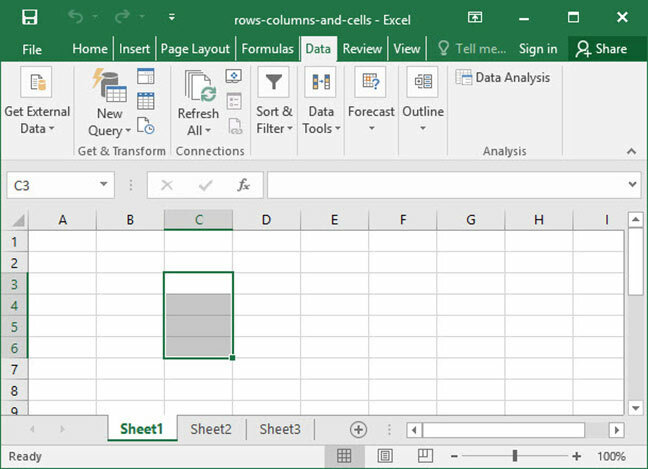 Those are the basics of row, column, and cell manipulation in Excel. There's much more to learn — we've only scratched the surface! — but you should now have a solid foundation on which to build. Questions or comments? Let us know below!